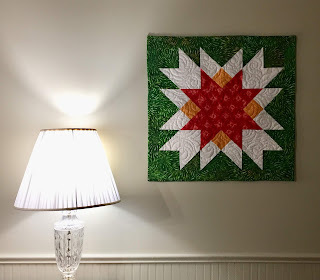 The "12 Days of Christmas in July Blog Hop", hosted by Sarah at Confessions of a Fabric Addict, is behind us, so now it is time for us to start our projects for Christmas ... we only have 6 months LOL! 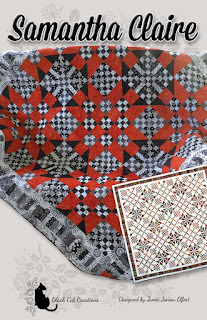 One lucky person has a head start -- Vicki in MN, will be receiving the Quilted Barn Quilt I made for the Blog Hop and two Black Cat Quilt Patterns. I have emailed our winner Vicki, for her mailing address. If I don't hear anything by August 1, 2018, I'll pull another name. Thanks to all who left a comment and visited. If you make a "Quilted Barn Quilt" from my tutorial, or a quilt from any of my published patterns, please email me a picture or link to your blog (address in profile) and I will share here on my blog. Thanks Jamie~I'm excited!! I emailed you tonight with my addy.